Continuing Professional Development > Tools & guidance > What is clinical audit? Please note that the National Council for Osteopathic Research website has information about clinical audit. Please click on http://www.ncor.org.uk/practitioners/audit/ for further information. The information below summarises the information outlined in the Clinical Audit Handbook and is designed to provide a simple overview. It is recommended, that before undertaking a clinical audit, all osteopaths should read the NCOR Handbook for Clinical Audit. Clinical audit uses data from your own practice in order to generate new insights about practice. Clinical audit is a process which can support quality improvement. Clinical audit can help you to look at your practice in a different way, learn new things and enhance your practice as a result of new knowledge. Providing useful evidence of continuing professional development activity. Outcome: The effect of the osteopathic management on the wellbeing of patients. For example, active care, education, or advice for patient self-management. This might include patient reported outcomes or patient satisfaction. Other examples included in the NCOR Clinical Audit Handbook include hyper tension audit, audit of acute low back pain, audit of effectiveness of treatment. You may also like to consider undertaking the clinical audit cycle using the NCOR PROMs. (see above). Process: This includes activities undertaken within a practice including those of support staff, and clinicians as they deliver patient care, for example, length of time from first contact to first appointment or the quality of patient notes, for example the recording of negative findings, the presence or absence of red flags or how consent is recorded, numbers of patients who do not attend appointments or letter writing. 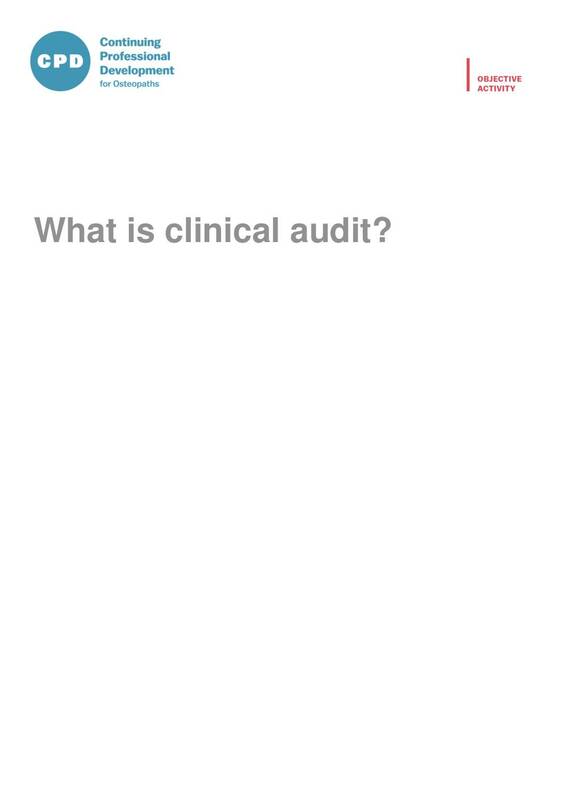 Examples of these audits can be found in the NCOR Clinical Audit Handbook. Structure: The manner in which resources and personnel are organised and available within a practice. Examples included in the NCOR Clinical audit handbook include a practice health and safety audit, This could also include access to premises. The handbook is available to all osteopaths. The Handbook provides information about clinical audits, templates and worked examples of clinical audits undertaken by other osteopaths. A general guide to audit, and advice on further sources of training can be found at the Clinical Audit Support Centre. Irvine D and Irvine S (eds). (1991). Making Sense of Audit. Radcliffe Medical Press, Oxford. Mawson SJ, and McCreadie, MJ. TELER: the way forward in clinical audit. Physiotherapy. 1993;79(11):758–761. Donabedian A. (1980). The definition of quality: a conceptual exploration. In Explorations in Quality Assessment and Monitoring. Ed. Donabedian A. Ann Arbor, Michigan: Health Administration Press.